Jeri Ellsworth has created an awesome hack using a Commodore 64 and transformed it in to a C64 Bass “keytar”, and was unveiled by Ellsworth at this years Makers Fair Bay Area. The fantastically innovative hack was created by splicing a bass guitar neck to the retro Commodore 64, you can hear Ellsworth explain her awesome hack and how it was created in more detail after the break. 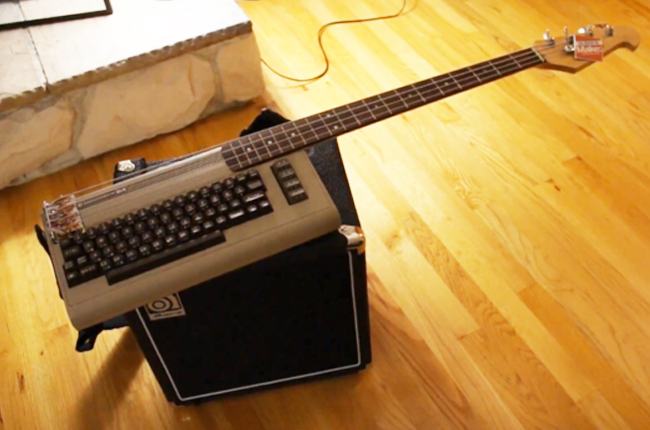 The Commodore 64 Bass “keytar” uses the original SID 6581 sound chip, and is fitted with piezo pickups to capture the vibrations from the strings. The one downside to the C64 “Keytar” at the moment admits Ellsworth it its poet consumption. Which eats through 18AA batteries every eight hours of play.